I’ve given up at the $27s, at least for a while. I’m on an absolutely horrible downswing, and for as much as I genuinely think I’m running abnormally poorly I’m just not confident enough that it’s the only reason I’m leaking money at hyperspeed. So, I’m going to drop back down for a while and try to win enough to take another shot. It’s pretty difficult to draw any conclusions from what’s happened this month because I really didn’t get to play enough tournaments to find any reliable trends, even though (sadly) the recent downward trend in my bankroll is pretty clear. I can believe that I might not have enough of an edge to beat the rake at this level - or even any edge at all over the field - but I simply can’t believe the later stages of this trainwreck graph could be representative of my long-term loss rate. I still thought it would be worth trying to correlate my luck against my results, using a refined version of the technique I developed earlier in the week. The graph below runs from the start of October until last night. 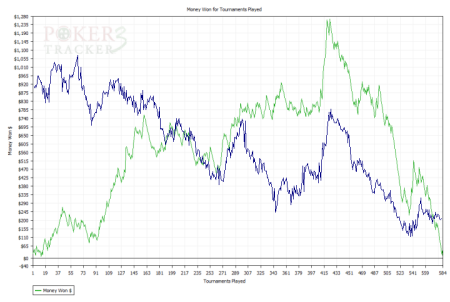 The green line shows profit over time and was generated by PokerTracker as normal. Then I used a pretty crude copy and paste to superimpose the blue line for my homebrewed luck factor, which I had further mangled to only generate a point on the graph on the very last hand I played in each tournament. There’s no particular scale for the blue line on the y-axis, and it’s not a perfect match but it lines up fairly well. Most of the sharp ups and downs are visible on both lines and overall I’d say that about half the time the movement of the two lines seems to be in harmony, but of course this isn’t always the case. However, while I rarely had losing streaks during spells of good luck I did have some winning streaks during spells of bad luck. If I had to suggest a hypothesis based on these graphs, I’d say that when playing the $16s luck did affect my results but at times I was able to overcome bad luck and still win anyway. On the other hand, once I moved up to the $27s (just before the sharp upswing on both lines) my good and bad luck has been the predominant influence on my actual results. In other words, my ability played a more significant role at the lower levels. In other words, there’s definitely a chance that I’m getting pwned at the $27s. However it is only a very small sample and, unfortunately, gathering more data could be pretty expensive.